Gloria Swanson in Billy Wilder’s « Sunset Boulevard » was one of the influences of the Gareth Pugh Spring/Summer 2014 Show. 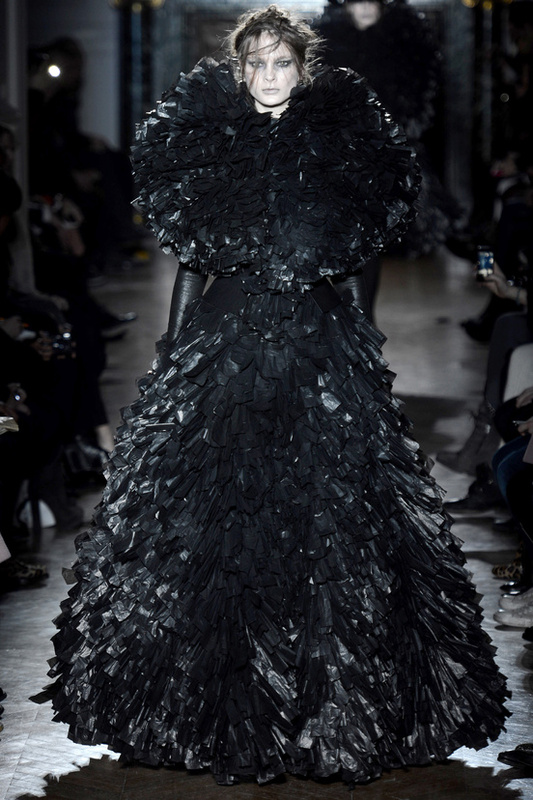 The Asgarda, a tribe of women living in the Carpathian Mountains, have influenced the Gareth Pugh Autumn/Winter 2013-2014 Show. Another Asgarda-inspired collection : Prabal Gurung Autumn/Winter 2013-2014 (the military style and the swirling prints that were highlighted in this collection were based on the Asgarda). 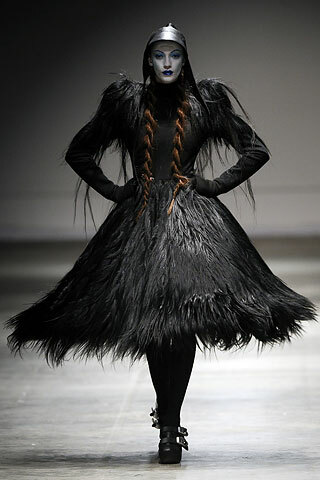 « The Wizard of Oz »’s Dorothy meets the John McTiernan’s « Predator » monster was the starting point of the Gareth Pugh Autumn/Winter 2008-2009 Show. Other Victor Fleming’s « The Wizard of Oz »-inspired collections : Annabel Winship Autumn/Winter 2007-2008 (« Dorothy Oz » and « Sweet Dorothy » shoes), Betsey Johnson Autumn/Winter 2001-2002 (the shoes were influenced in part by Dorothy’s), Heatherette Autumn/Winter 2007-2008 (« Over the Rainbow »), Marc Jacobs Autumn/Winter 2010-2011 (« The Wizard of Oz »-themed show), Rodarte Autumn/Winter 2011-2012 (red dresses). Moreover, in 2000, Hiroaki Ohya designed the « Ohya The Wizard Jeanz » book-clothes, inspired by L. Frank Baum’s « The Wizard of Oz » book, and, in 2008, in celebration of « The Wizard of Oz »’s 70th anniversary, designers (including Diane von Furstenberg, Giuseppe Zanotti, Jimmy Choo, Manolo Blahnik, Moschino and Roger Vivier) created new versions of Dorothy’s slippers, using Swarovski CRYSTALLIZED Elements.